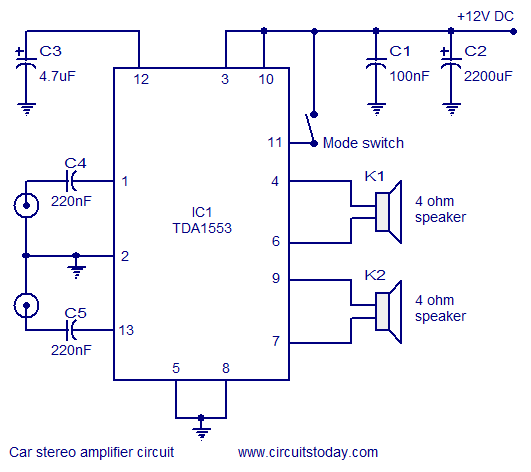 Here is the circuit of a car stereo amplifier based on TDA1553. TDA1553 is a monolithic Class-B audio amplifier which contains 2 x 22 watt amplifiers in bridge tied load configuration. The amplifier operates from 12V DC and is developed intentionaly for car audio applications. The IC also has a load of good features like short circuit protection, load dump protection, reverse polarity protection, loud speaker protection etc. In the circuit , C5 and C4 are input decoupling capacitors while C3 sets the delay time for loud speaker protection. C1 and C2 are power supply filter capacitors.